Ryder Cup Winners Receive Captain’s Gifts Including Customized Smoker Cookers Made by Lang BBQ Smokers®. The USA team won the Ryder Cup and the US Captain, Davis Love III selected customized Lang BBQ Smokers® as one of the Ryder Cup Captain’s gifts. The smoker cookers are made in the USA and are currently being built and shipped to US Ryder Cup team members. As winners of the 2016 Ryder Cup at the Hazeltine National Golf Club in Chaska, Minnesota, the US team will be receiving Ryder Cup Captain’s Gifts. Ryder Cup Captain, Davis Love III selected smoker cookers made by Lang BBQ Smokers® customized with the Ryder logo as one of the Ryder Cup Captain’s Gifts. The first seven smoker cookers have already been built, shipped, and received by Jim Furyk (vice-captain), Steve Stricker (vice-captain), Zack Johnson, Jordan Speith, Brandt Snedeker, Patrick Reed and Jimmy Walker. Ryder Cup Captains serve as spokesmen for the team and attend public relations activities including those of a charitable nature. They also select the Ryder Cup Captain’s Gifts which go to the winners. Love selected Lang BBQ Smokers as one of this year’s gifts for his team. 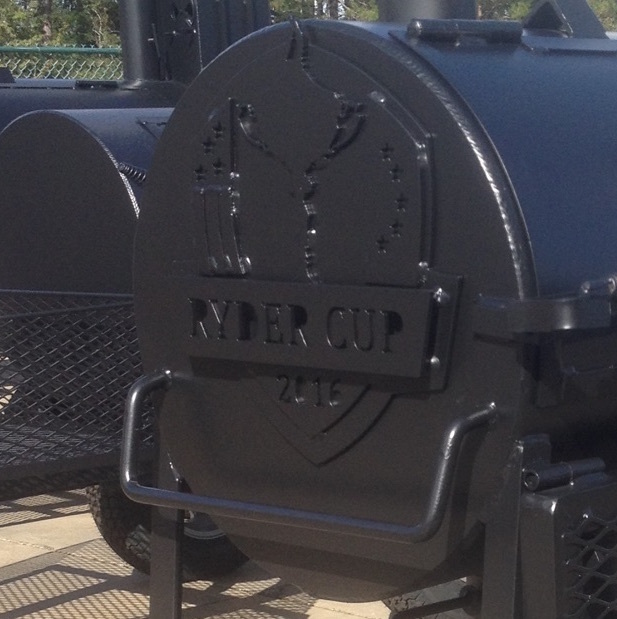 Each of the 36” Hybrid Deluxe units have a charcoal grill and smoker cooker and are customized and emblazoned with the renowned Ryder Cup logo. Love is a long-time smoker cooking enthusiast. “When I’m not on the golf course practicing or competing, I’m relaxing with my favorite pastime, cooking BBQ for my family and friends. My equipment has to yield me great results. That’s why I use Lang BBQ smokers,” stated Love. Since 1988 when Ben Lang invented the Lang BBQ Smokers®, they have become the standard in the barbecue industry. Ben Lang engineered a revolutionary way of grilling, cooking and smoking meat, chicken and seafood. Lang BBQ Smokers, the originator of the reverse- flow, off-set firebox design that, along with the heavy, 1/4-inch plate steel construction, allows for even, consistent sizzling and searing of the meat to goof-proof perfection. As a family owned and operated business, personal care and pride of ownership has made the Lang family icons in the barbecue industry. Based on their popularity, Lang now offers their smoker cookers as corporate gifts complete with customizations and logo imprint.